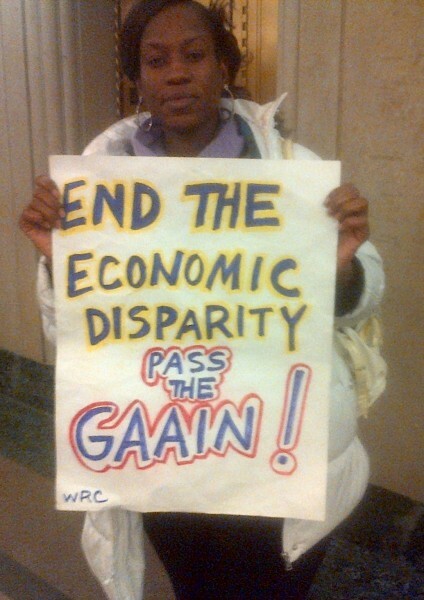 Welfare Rights urges MN lawmakers to provide aid to all in need | Fight Back! St. Paul, MN – Members of the Welfare Rights Committee were at the hearing held by the Legislative Working Group on Economic Disparities in Minnesota, Jan. 15, to press their demand that the politicians include the GAAIN (Give Aid to All in Need) bill - Senate File 1426 and House File 1533 - in the working group’s final recommendations. The proposed GAAIN legislation would expand the number of people eligible for public assistance and raise the benefits. “There is no question that poverty rates are highest in communities of color across the state of Minnesota, therefore there is a larger section of our people who have nothing. When you have nothing, you are shut out of almost everything,” said a statement from the Welfare Rights Committee. The GAAIN legislation will be debated by politicians at the upcoming legislative session.